• Advanced digital control with 56-bit DSP, controlled diffraction / low resonance enclosure and time-aligned crossover, deliver superior audio with ultra-linear frequency response. • Powerful Class D bi-amplification system (50W RMS) provides plenty of headroom with lightning-fast transient response. • High-rigidity custom composite material woofer plus large flare bass reflex port produces “best in class” bass response down to 55Hz. • High-quality woofer and tweeter — like ones found in high-end systems — without the high-end price. • The smallest footprint of any reference quality studio monitor system. • Fits anywhere — provides high-definition monitoring in the tightest spaces. 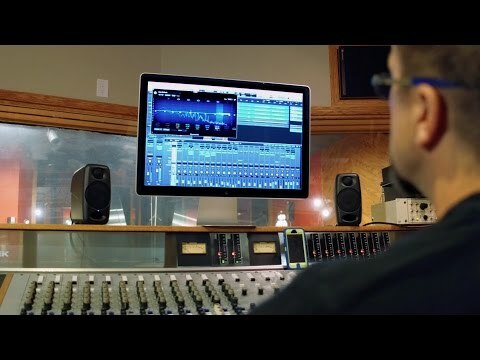 • Can be placed closer to you than other monitors reducing the effects of room reflections and standing waves. • The first monitor system you can easily carry with you anywhere you go. • Desktop or monitor stand placement with selectable EQ correction and adjustable integrated isolation base optimized for your setup. • Mounts on regular mic stands for free-field positioning with no need for additional accessories. • Wired connection with 1/8” stereo mini-jack and RCA inputs for recording, mixing and mastering. 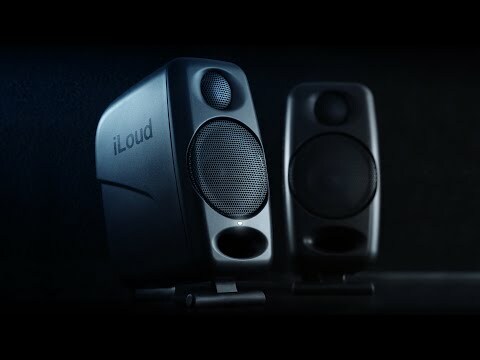 • Size: 180mm/7.09" x 135mm/5.31" x 90mm/3.54"
IK Multimedia iLoud Micro Monitor Speakers, Compact Studio Quality, Advanced Digital Control 56-bit DSP Pair is rated 5.0 out of 5 by 2. Rated 5 out of 5 by Luke0007 from Wow What a great surprise, amazing sound quality. Specialy in conection with SP15 norma. Highly recommending this product. Rated 5 out of 5 by Lancs from Impressed with these tiny terrors! Over the course of several weeks I took in many, what I understood to be honest, reviews on the iLouds before making a decision to purchase them, and all I can say is that they definately do live up to the hype! I have a small untreated studio room, which I beleive these micro near-field monitors are ideally suited for, not to say they wouldn't work well in any, if not all environments. For their size and the price, they truely do sound phenominal! - solidly built, will fit anywhere, with great bass response and a tonne of clarity on the mids/highs, they absolutely deliver on detail. Very happy with the outcome having made the decision to own these as my first pair of (micro) monitors.